Create your own little paper robots! | Print, Cut, Paste, Craft! 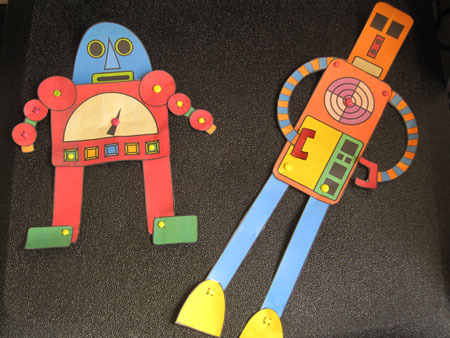 Create your own little paper robots! I love cute little robots, I like drawing them and imagining what they could do, so I am trying to get my son to love them too of course. I made these little ones out of paper, but I recommend using cardstock instead. They are made of a few, easy to cut, parts and held together by little brads. I happened to have brads at home because of a previous scrapbooking project. You can find colorful ones in any scrapbooking/hobby store and they really add to the look of your robots. These are just four of many combinations you can create whit the parts that I designed! 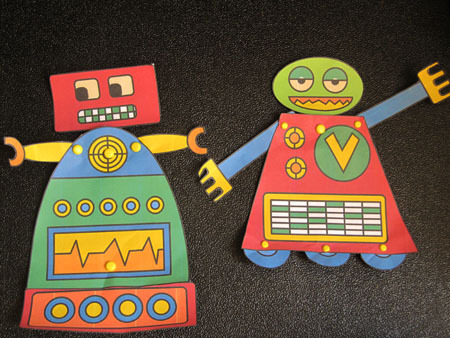 All you need to create your own cute little paper robots is a printer,some cardstock, scissors and brads. I have created two templates for you: one in black and white ( download the pdf here) so you can let your kid color it anyway he likes and one pre-colored ( download the pdf here) in case you want to skip the coloring. If you do create your own robots please post a comment below! And don’t forget to send us a picture of your little creations at info@print-cut-paste-craft.com, we’ll make sure to post it! The link isn’t working, but if i remove the “http//” from the address, it will work find. Just wanted to let you know because this is an awesome printable! Thanks for what you do!